When you scan through The Italian Regional Cookbook by Valentina Harris a couple of things strike you. First, you have to get it off your lap and onto a table. At 600 pages and 5 pounds, the book has heft. Good heft. The book is flooded with photos that slow down your scanning progress. We saw a picture for this Meatball and Ricotta Bake, we read the headnote, and we knew had to make this dish. Small balls of clove-scented ricotta and beef are layered in a dish, bathed in stock and poached in the oven. This is a dish from Messina, the third largest city in Sicily and yet another reason to book a trip that fabulous island. Put the beef in a large bowl. Season well with salt and pepper, then add 2 tablespoons of Parmesan cheese with the breadcrumbs and parsley. Beat 2 of the eggs lightly and add to the bowl. Using wet, clean hands, mix the ingredients together. Add a little stock if necessary, to bind the mixture, but not too much as it should be firm, not sloppy. Pinch off small pieces of the mixture and roll into tiny meatballs, no larger than big olives. Pour the stock into a large pan and bring to the boil. Lower the heat to a simmer and then add the meatballs. Simmer for no more than 3 minutes. 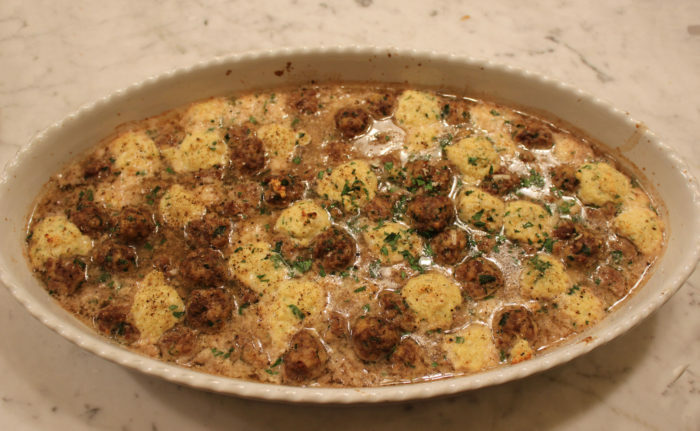 Lift the meatballs out with a slotted spoon and put them on a dish. Set aside to cool. Leave the stock over a low heat. Preheat the oven to 400°F. Put the ricotta in a bowl and add the remaining Parmesan cheese. Beat the remaining eggs lightly and add them to the bowl with the ground cloves. Season. Shape the ricotta mixture into balls the same size as the meatballs. The ricotta needs to really dry and stiff – if the mixture is too sloppy, add more breadcrumbs and Parmesan until you can shape it into balls with ease.